PHUKET: The series of major public holidays next weekend will bring a ban on the sale of alcohol for two consecutive days and see all major government offices close for a four-day weekend. Buddhist holidays will see a ban on alcohol sales across the country, including Phuket, next Friday and Saturday (July 27-28). The auspicious Buddhist holidays Asarnha Bucha Day and Khao Phansa (Buddhist Lent), also called “Vassa”, will be observed next Friday and Saturday (July 27-28), respectively. As both are major religious holidays, the sale of alcohol is banned across the nation on both days. 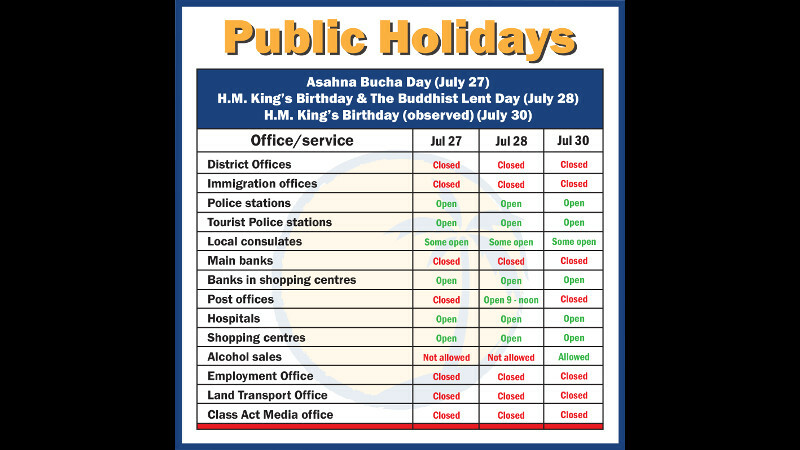 Asarnha Bucha Day and the beginning of Buddhist Lent have been mandated “National No Alcohol Days” since 2009 by an order that also banned the sale of alcohol on the major Buddhist holidays Makha Bucha Day and Visakha Bucha Day. Also, with the 66th birthday of His Majesty The King Maha Vajiralongkorn Bodindradebayavarangkun this year falling on a Saturday (July 28), the country will observe the national public holiday on Monday (July 30), with all government offices closed. To mark the month of special events, the government is calling on households, workplaces and government offices to be decorated with images of HM The King and national flags together with Royal Standards of the monarchy. Thai flags are to be set at the right side of the buildings and flags of the monarchy are to be set at the left. A national cleanup day held in honour of HM The King, with the event led by the Prime Minister and the Cabinet, will be held near Government House next Thursday (July 26), with separate Big Cleaning Day projects conducted in every province across the country on the Saturday (July 28). To honour the occasion, a merit-making ceremony will be held nationwide at the same time, 7am.